Sun-Sky Time for Iray is a small script that simplifies the task of setting the time under the Iray Sun-Sky Environment. Uncompress the file on any desired folder, click on the clock icon inside DAZ Studio, and enjoy. 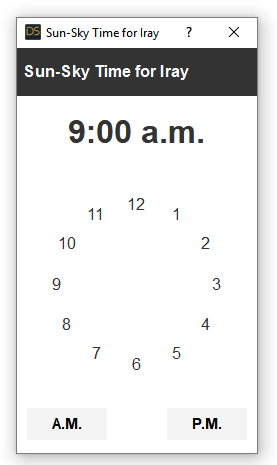 The main screen shows the hour digits, click on any number to select the corresponding hour, after that the numbers change to allow you to select minutes. If you want to click on a number without switching from hours to minutes, hold down the Control key. Thanks jag11. I've hardly used the sun-sky only settings so far, so this will encourage me to experiment a bit with them. Thank you, Custom Action created!